My Zojirushi BBCCX20 Bread Machine needs another pan. (I use my bread machine a LOT so the pans and blades only last a year or two.) The machine is still fine, but I got it back in 2008. I didn’t want to pay for a pan only to have the machine bite the dust a few months later. I thought about it for a while and have decided to get a new machine. I wasn’t sure which one to buy though. 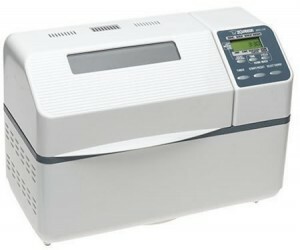 I’ve always used Zojirushi because I love the quality of the machines and their ease of use. However there are different models. I wasn’t sure which one to buy. Here’s how I made my decision. My current machine, the BBCCX20 is still offered at Amazon, but I no longer see it on the Zojirushi site. I wonder if it’s going to be discontinued. 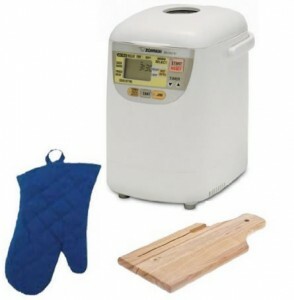 The Zojirushi BB-HAC10 Home Bakery Mini Breadmaker Kit gets a lot of good reviews. It’s a one-pound machine with a small footprint. However I use my machine almost every day so I need one with a larger capacity. 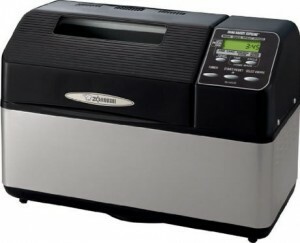 I’ve been eyeing the Zojirushi BB-CEC20 Home Bakery Supreme 2-Pound-Loaf Breadmaker for quite a while. Don’t you love the stainless finish? (It also comes in white in case you’re not a fan of stainless steel.) When this model first came out I thought that the only difference between it and my BBCCX20 was the color. However if you read the reviews some people seem to have a hard time getting the top of the bread done to their liking. It gets rave reviews with that small exception. That leaves the Zojirushi BB-PAC20 Home Bakery Virtuoso . 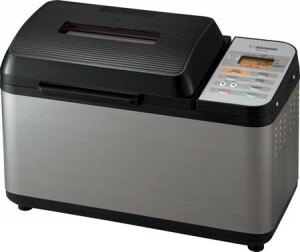 This machine solves the problem of the uneven crust by having an additional heater in the lid. It also has a gluten-free bead setting. It also has a lot of great reviews. So this is the one that I bought. The machine came yesterday and I’m excited to use it! 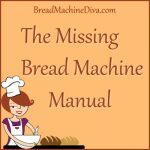 Do you have a bread machine, but no manual? 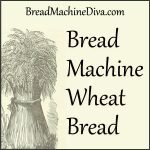 Here's a list of links to online bread machine manuals. I haven’t used the delay function of the bread machine. I’ve always wondered about it though. I’ve added it to my to-do list as it’ll be a fun experiment. I’ll do a blog post about it when I’ve tried it. Marsha, have you used the Homemade function on this Zojirushi? Sometimes I feel like bread machine-made bread comes out better when you just use the dough cycle and then a regular oven to bake. But I haven’t used the Homemade function, which lets you program all the rising times, shape, and bake back in the machine. It seems a bit complicated. Great question. I’ve used the homemade function and it’s not as difficult as it looks. 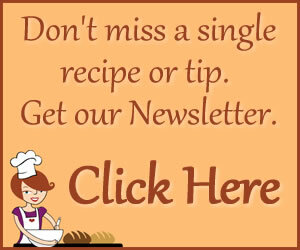 You can find the recipes here – https://www.breadmachinediva.com/category/home-made-function/. I don’t recommend the meatloaf though. I want to experiment more with the homemade funtion to make cakes. I’ve only found one cake recipe that I think is good enough to post and I know that people want to see more recipes like that. The problem is that my bread machine cakes either turn out to be undercooked or tough because they’ve been stirred too much. I’m hoping the homemade function might take care of those issues. This morning I bit the bullet and learned how to program the Homemade function, even though I was somewhat intimidated. I’m trying the crusty French bread from the manual, wish me luck. Now I am going to look at your recipe page… thank you for providing this resource. Good luck! And if you want to make a cake with the bread machine I do have one recipe that works well. It’s for pound cake. 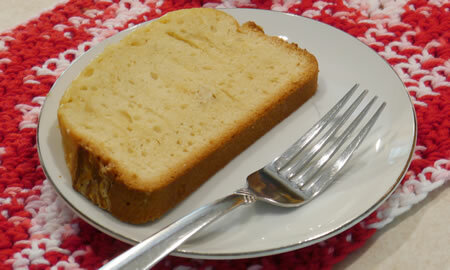 My household loves pound cake! The crusty French bread turned out great. I had a brief scare when I thought it wasn’t rising enough but it ended up being fine. I may have to replace the pan because there are a few nicks in it from when I did not adequately secure the paddles. They came loose and scratched the pan – probably not a good thing when you have a nonstick coating. Let me know how it goes. Oh, and be careful what recipe that you use with the delayed cycle. Since the ingredients have to sit in the pan overnight it’s best not to use that cycle with a recipe that has eggs or other things that might go bad. To me, it is seems easier and less messy, than sifting/wisking the flour to unpack the flour then measuring it, to get a consistent volume of flour. I just put the bowl on the scale and zero the scale, then keep scooping flour in, until it reaches the weight for x cups of flour. Done, and no mess from sifting/wisking. I guess I might need to start doing this to get consistsnt results,,especially with loaves I use on delay mode, which kind of scale are you using? I just went to Bed Bath and Beyond and got low cost DIGITAL kitchen scale that could measure in grams. Be careful, as I have a scale that I got earlier that would only measure in 5 gram increments, not 1 gram. That is several teaspoons of flour difference. Hi Heather, We actually slice and freeze our extra bread. That way nothing spoils and we have a reserve of bread just waiting to be toasted. 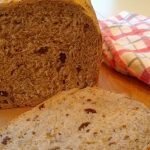 However, if you’d like a recipe for a smaller loaf, I’ve written an article on converting bread machine recipes to different sizes.